It’s always a little thrill when the cell phone vibrates and the text messages start coming in: “CTT Data Update: Unit #27236551 (Salisbury 4Y Male) has checked in.” And then another, and another, until we have the weekly report from our far-flung tribe. The three amigos (well, two amigos and an amiga) were back together on Amherst Island this past week, and another snowy continues to flirt with airport trouble. Our easternmost owl likes the beach, and our westernmost is enjoying her big-sky horizons on the prairie. One is happily on ice. We’ll skip Dakota, our newest owl — we just updated everyone yesterday on her capture in North Dakota. So let’s start with Salisbury. He’s continuing to play with fire, dropping by Boston Logan International Airport every few days. 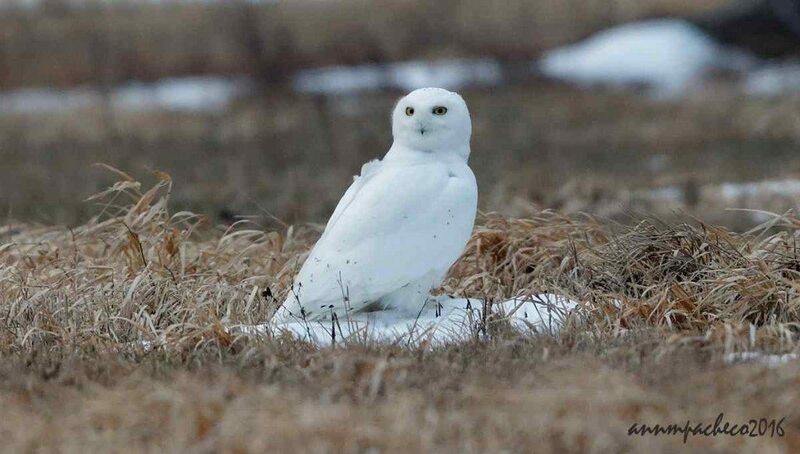 We knew he liked it there, as do many snowy owls passing down the Massachusetts coast; he was first banded there in 2014 by Norman Smith, and that’s where Norman caught him again several weeks ago before tagging and moving him north. Salisbury’s favorite spots this past week have been near Squantum, about four miles (6.5 km) south of Logan, and a traditional hotspot for snowies — Norman’s taken me there in the past to look for them. 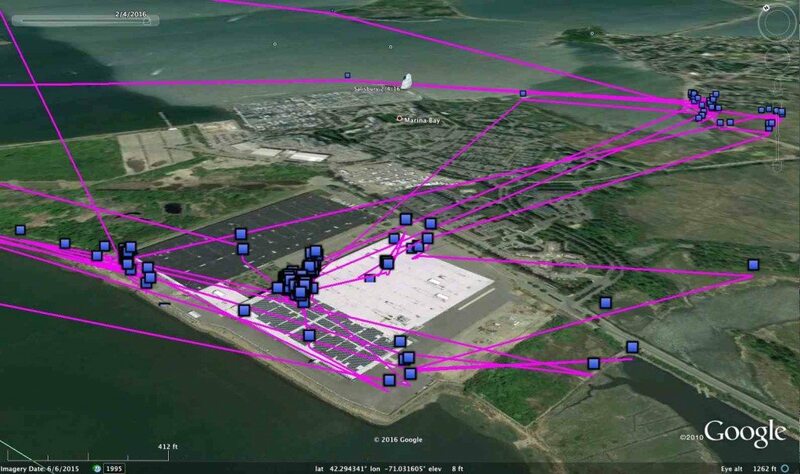 The utility poles along the edge of Squantum Marsh have been favorite hunting perches for him, but the owl’s been spending a lot of time on the immense roof of the Boston Scientific warehouse, right next to the Neponset River. The roof of the warehouse is white, and it must make Salisbury feel at home — even when there isn’t a fresh snowfall, as hit the Boston area on Friday. Farther up the coast, Brunswick continues to provide a well-behaved contrast to Salisbury. She makes an occasional flight north to Kennebunkport or south to Ogunquit, but spends the bulk of her time on Wells Beach, using the waterfront houses for day roosts. Her movement pattern is complex, but my impression is she’s a surf-and-turf girl, splitting her hunting between the tidal marshes of Rachel Carson NWR and the Wells National Estuarine Research Reserve, and the shoreline and near-shore waters on the ocean side. The former should provide opportunities for small mammals and waterfowl, while the coast would be primarily a waterbird buffet. Wampum’s transmitter remained silent again this week; all we can do is hope that there’s been some problem with the unit (perhaps with its recharge rate) or that she’s hanging out somewhere with no cell reception. But it’s obviously worrisome, given the severity the nor’easter a couple of weeks ago, and her exposed location on Penikese Island. Snowy owls love ice, and Tibbetts has been roosting up to a mile and a half (2.5 km) from shore, out on the frozen bay — though at night he’s been coming in to shore and making short forays from two small points of land at the southwestern end of the bay. It’s a little hard to judge from the poor resolution on daily NOAA CoastWatch satellite images, but it looks like there may be some open water there — which would make sense, since it sure looks like he’s hunting that area, presumably for waterfowl. Finally, there are what I’ve come to think of as the Three Amigos of Amherst — Flanders, Baltimore and Chaumont. Flanders moved back from the mainland on Jan. 30, and traveled around quite a bit — including pushing into Baltimore’s territory up by Stella. Midday on Feb. 2, they were within 1 km (.6 mile) of each other, and at about 4 p.m. that day she passed within a few hundred meters of where Baltimore was perched. As of Thursday night, though, Flanders was back on her old roost spot at the tip of Nut Island, where she’s spent much of the winter. Baltimore, on the other hand, has really settled into a pattern. He’s using a very small range of about .3 by .5 km (.2 by .3 miles), almost as constricted as the neighboring territories used last year by Chippewa and Whitefish Point. During the day he stays well out in the hay fields far from the road, away from the many birders and photographers prowling this internationally famous owling hotspot. 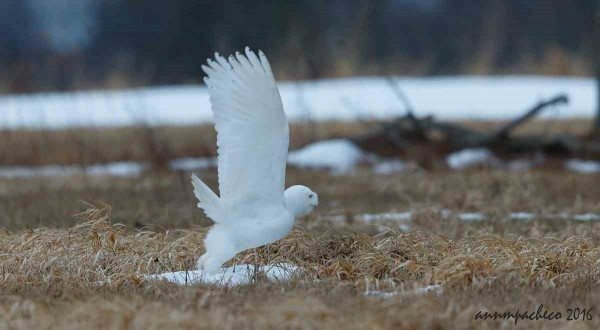 At dusk, he moves to a couple of favorite hunting perches by the Amherst Island Public School — but by then, it’s too dark for cameras or binoculars. Chaumont is also staying well back from the road at the eastern tip of the island, in a generally inaccessible place. We’re still slowly downloading backlogged data from his transmitter, so we’re not getting his current, detailed location data (though his unit is still recording it). But what we did get this week were stunning photos of Chaumont from photographer Ann Pacheco. She and professional photographer Melissa Groo (both of whom are enthusiastic SNOWstorm supporters) encountered Chaumont a couple of times during their sojourn on Amherst. Working with local bird guru Janet Scott, who has been very helpful to us as well this winter, they wanted to get us good photos of our tagged bird. Baltimore didn’t cooperate, but Chaumont showed off. And speaking of photos, Laurie Kilpatrick was kind enough to send us photos of Flanders, which she took along the south side of the island last week. There are (depending on estimates) at least nine or 10 snowies on Amherst this winter, and most of the photos that visiting shutterbugs are taking have been of untagged owls. But it’s been great to get photo updates of our transmittered snowies, like those from Laurie and Ann, and we appreciate everyone’s efforts. As always, if you’re interested in our work, we’d ask you to support us by sharing the news via social media and elsewhere. And, if you haven’t done so, please consider a tax-deductible donation through our Indiegogo campaign. It’s gotten off to a bottle-rocket start in the past week, and we have some really cool perks again this year. I think we saw Flanders on Sunday when we went to Amherst Island. That’s great! It’s been a treat having three of our tagged owls in such a birding mecca this winter. Were you able to see her transmitter (the black solar panel is usually visible from behind, high in the middle of the back)? on your web site. I have uploaded a picture of this owl. Can you confirm if this is Flanders? 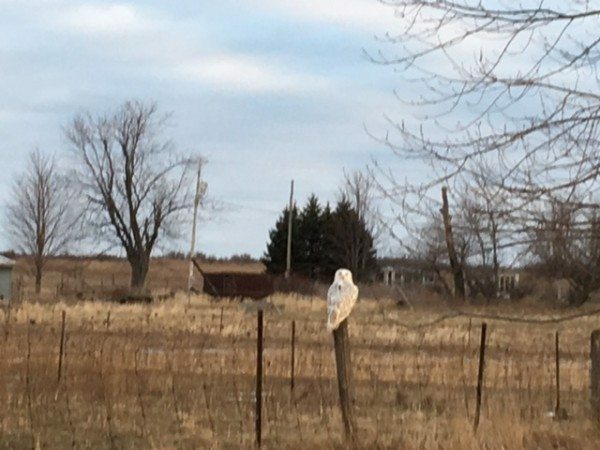 This owl was at the following location on Feb 7 at 15:54. Yep, that’s Flanders all right — she’s much more heavily marked than the two adult males on the island, Baltimore and Chaumont. The solar panel has a few feathers covering the sides, which is why it doesn’t look like a rectangle. 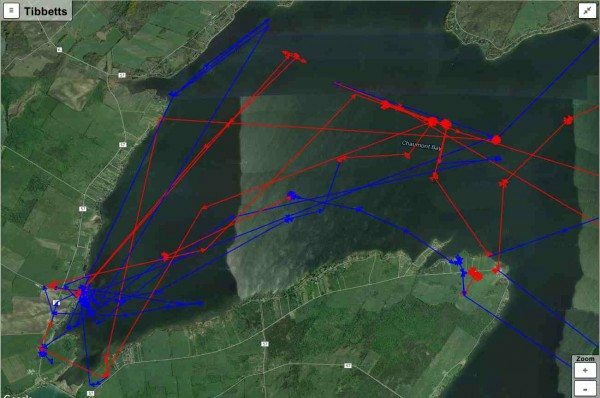 We’ll get Flanders’ tracking data for the past week on Thursday evening, including this position — but in the meantime, thanks to you, we know she was doing some late afternoon sunbathing on the north shore — that’s a spot she’d been using back around Feb. 1-2, just after coming back from the mainland. area so please let me know if there’s anything I can do. Thank you for all your hard work to make this project going. We checked our GPS coordinates, they’re very close to the ones posted below. Our’s are for 11:10 am Feb 7th. I took a flight that departed at 8 am on Jan 30th from terminal E in Logan. Right before we took off (from the outermost runway close to water), I saw a Snowy Owl sitting on an adjacent runway sign (low red structure with white letters on it). As a birder and Project Snowstorm supporter, I could not believe my eyes! I had to contain my excitement until we reached a cruising altitude and I could tell the flight attendant about what I had seen. I wasn’t sure she had believed me until at the end of the flight she told me she had notified the pilots who had called the ground control in Boston. I have been meaning to check this blog to see if you had any mention of any birds at Logan during that weekend and finally was able to do that today. Based on this and the earlier post, I am sure I saw Salisbury (and not a decoy! suggested by the flight attendant). Thanks for your great work and for the opportunity to share my story. I look forward to considering your Indieogo campaign again.